Time for another Read Aloud Thursday over at Hope is in the Word. No, the weather is not accommodating enough for us to hit up the zoo just yet. Moms in rainy Oregon are looking for a goodly amount of indoor activities to keep the kids contained and energized. A few more months and we'll be free to explore the outdoors again and one of the things I am looking forward to doing is going to the zoo with our young squire. In the meantime, we dream with a few good books. I recently discovered Sylvan Dell Publishing. I was initially attracted to them because they seem to have a good set of artists who provide the illustrations for their books. (I reviewed Little Skink's Tail last week which was another Sylvan publication and the illustrations in that book were fantastic also.) 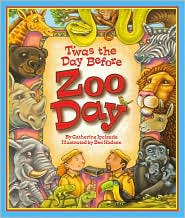 Sylvan has a title called 'Twas the Day Before Zoo Day which tells the story of the zoo as it is before the kids come. Zookeepers are bustling about cleaning animals. Animals are resting comfortably as well as keeping the zookeeper's busy with their individual antics! All of this is told in rhyme and is quite clever. Thanks to Horton, we're particularly fascinated by elephants and I'm pleased to say that the elephants make a few appearances within the pages of Zoo Day . In fact, he loves the elphants in this book so much that I'm frequently prevented from turning the page away from them. When we're done with the story I am obligated to return to the elphant page and the book will remain open on the floor, where they can be viewed conveniently as a full page spread (and floor decor). My one and ONLY objection to this book is that animal "doodoo" is referenced which kinda bugs me as the mother of a boy. I'd rather him not use that word but since he can't read yet I can substitute another word in its place without affecting the rhyme. Otherwise, the book has great kid appeal and - again - love the illustrations! Paws, Claws, Hands, and Feet is another offering from Sylvan (you'll start recognizing the style after awhile). 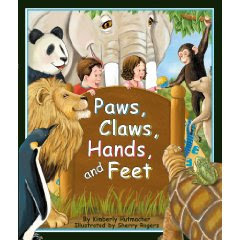 This book is also told in rhyme and offers children the opportunity to learn about the way that various animal's feet, paws and claws (as the title suggests!) are different and unique. This book is suitable for very young toddlers as it is very simple in nature and more about the pictures and the animals themselves than it is about the words. However, at the end of the book there is a matching game where children are given additional and more detailed information about the function of each animal's foot and "hand" design. 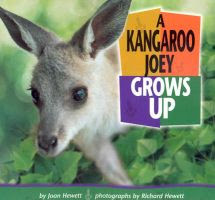 A Kangaroo Joey Grows Up and A Koala Joey Grows Up (published by Lerner Publishing Group) are a bit beyond our current reading range, however we like animals so much that we're content enough to sit through the entirety of these two books. Each of these titles focuses on individual animals that are being raised in a wildlife protection park. It details the animal's life from birth to adulthood and documents the changes in body and development. My two year old said of the koala: "It's cute!" so I'm not sure how much of the information this book offers that he is actually storing away, but he does like hearing their stories. There are several books in this series also, including A Penguin Chick Grows Up and A Giraffe Calf Grows Up (among others). Lastly, just for fun, you've got to check out this great book I found to help kids learn how to tie their shoes. (Right now we're using velcro but I'm a planner and I'm thinking ahead here!) The Zoo's Shoes: Learn to Tie Your Shoelaces! Each page of this book features a different zoo animal who needs some help with their shoes! This is an extremely cute concept, not to mention package design. 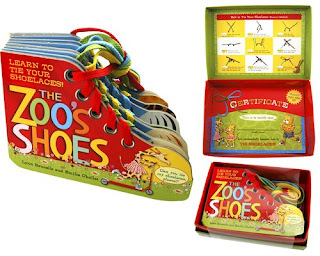 The book comes in a little shoe box and it also includes a certificate for the young reader that you can give them once they've learned to tie their own shoes. I love it! I've discovered that if a book has an animal in it (the animal of choice this week being the elephant) it is likely it will hold his attention, no matter how many words are on the page. Any book all about people though is quickly dismissed. I don't know what it is about animals but, well, we really like them! Hence I am eagerly looking forward to a break in those clouds! I hear you about being ready for a break in the weather! We're headed out in a bit for a picnic at the park (as well as a errands/shopping at a half dozen other places!) since it's going to rain tomorrow. These Sylvan books look fun! My girls, especially Louise, love animal books, too. Oops--that's me up above! I hit enter before I typed my name, etc. It's me, Amy @ Hope Is the Word--not sure what's happening to my comments. . . These look great-- we're just outside of DC, so the National Zoo is our 'hometown' zoo you could say. The kids certainly know their way around the monkey areas-- the orangutan line (where the O's walk across the wires way above the crowds) is our favorite. Thanks very much for the complimentary review of 'Twas the Day Before Zoo Day. I love hearing which animal is a child's favorite and am glad your little boy enjoyed Ben Hodson's illustrations. Hope you're able to make it to the zoo soon; until then, keep enjoying 'Twas the Day Before Zoo Day! I know Dmitrii would love some of these. We are going to the bookstore this weekend, so I am happy to know about these. Animals are his #1 thing right now! animals. Catherine did a great job fitting in so many varieties!! I think my favorite is the mama and baby gorilla at the end.